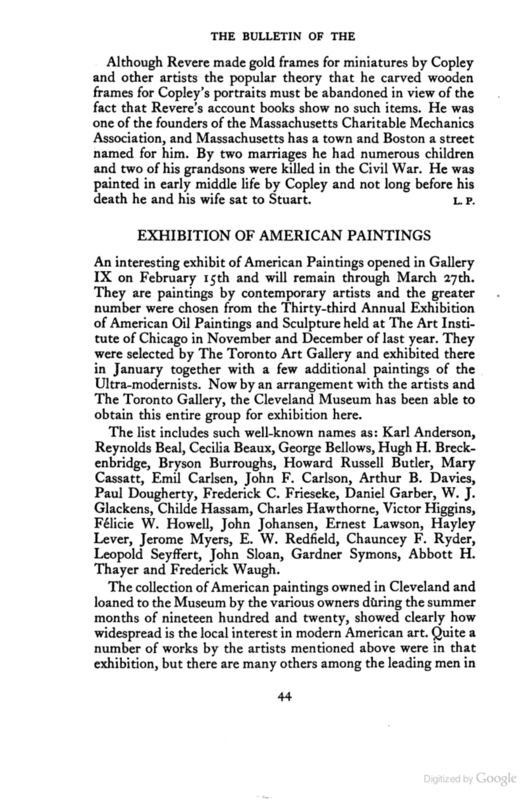 An interesting exhibit of American Paintings opened in Gallery IX on February 15th and will remain through March 27th. They are paintings by contemporary artists and the greater number were chosen from the Thirty-third Annual Exhibition of American Oil Paintings and Sculpture held at The Art Institute of Chicago in November and December of last year. They were selected by The Toronto Art Gallery and exhibited there in January together with a few additional paintings of the Ultra-modernists. Now by an arrangement with the artists and The Toronto Gallery, the Cleveland Museum has been able to obtain this entire group for exhibition here. The list includes such well-known names as: Karl Anderson, Reynolds Beal, Cecilia Beaux, George Bellows, Hugh H. Breckenbridge, Bryson Burroughs, Howard Russell Butler, Mary Cassatt, Emil Carlsen, John F. Carlson, Arthur B. Davies, Paul Dougherty, Frederick C. Frieseke, Daniel Garber, W. J. Glackens, Childe Hassam, Charles Hawthorne, Victor Higgins, Felicie W. Howell, John Johansen, Ernest Lawson, Hayley Lever, Jerome Myers, E. W. Redfield, Chauncey F. Ryder, Leopold Seyffert, John Sloan, Gardner Symons, Abbott H. Thayer and Frederick Waugh.